Download "Downloading and Installing Core FTP"
1 What is FTP? 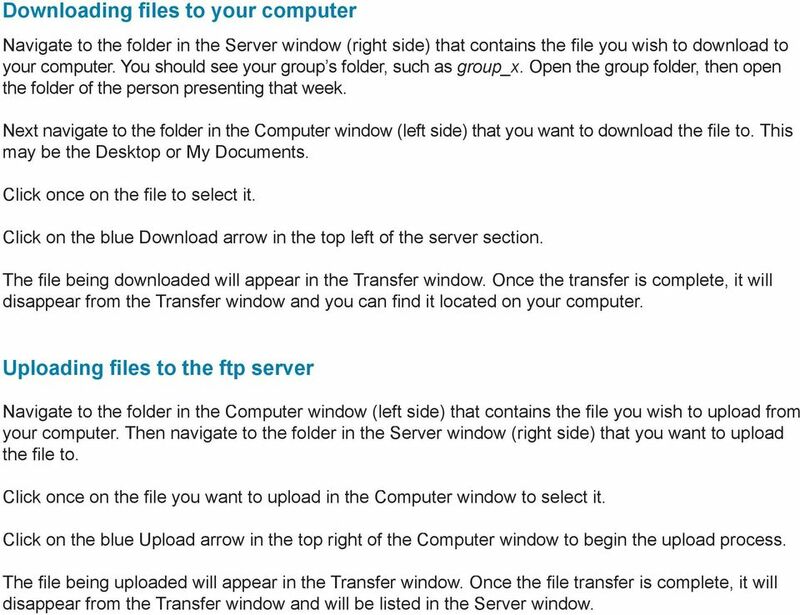 To transfer the fi les from your computer to a web server, a special protocol (transfer method) is used: FTP - the File Transfer Protocol. This protocol was designed to be able to handle big fi les. We will use Core FTP as our FTP application to transfer fi les to and from the FTP server. Don t worry if it looks complicated at fi rst. It s actually easier than it seems. Downloading and Installing Core FTP Go to: Select one of the links to download the free version of Core FTP LE. Select Save to Disk and then click OK. The installer will be downloaded to the desktop. Go to the desktop and look for the coreftplite1.3.exe installer fi le. Doubleclick on the icon to start the installer application. Follow the prompts in the installer application. Most people can simply accept the defaults. The installation will be complete once you have clicked Finish. Opening Core FTP Go to the Start menu. Select All Programs, Core FTP and then Core FTP Lite The fi rst time you open Core FTP Lite, you will be asked if you would like to make it your default FTP client. Click Yes, No or Cancel depending on your preference. Next the application will ask if you would like Notepad to be your default text editor. Click Yes or No. Most users will want to click No. 2 Setting up Core FTP and logging in You should now be looking at the Site Manager Window. This is where you will set up access to the FTP server. Enter the following information: Site Name: You can enter anything you like. This is only so you can identify it. I chose Global Mental Health. Host/IP/URL: caprisun.dreamhost.com Username: Enter the username you were ed. Password: Enter the password you were ed. Check Don t save password if someone else has access to this computer. Leave the remaining options set to the default settings. Click Connect in the bottom center of the window. The application will contact the ftp server and log you in. 3 The Core FTP Window The top of the window contains the log of your actions during your ftp session. You will generally not need to pay attention to it, but it can be useful if there is a problem. Below the log are three sections or windows: the Computer window, the Server window and the Transfers window. Computer window: The section on the left represents the fi les on your computer. The fi rst time you log in this section will show the contents of your C: drive. You will need to navigate to the folder that contains the fi les you wish to upload to the server or to the location you wish to download fi les to. You can navigate to another location on your computer by double clicking on the folder icons. To get to My Documents the path is C:\Documents and Settings\username\My Documents. To get to the Desktop of your computer the path is C:\Documents and Settings\username\Desktop.If you need to navigate back to the folder above the one you are in, click on the icon of the white folder with the blue up arrow (get icon) located above the list of fi les. There are also several buttons along the top of the Computer window to help with tasks and actions. 4 Computer Window buttons: Search search for fi les on your computer. 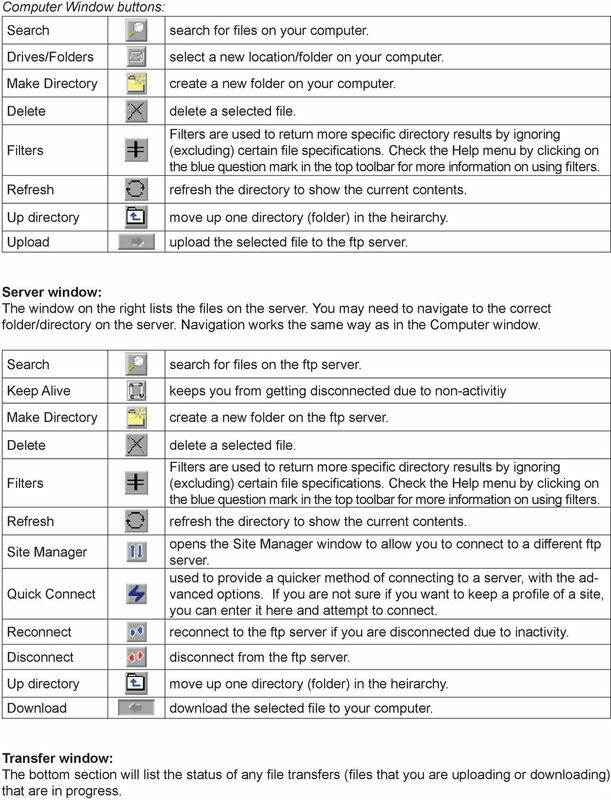 Drives/Folders Make Directory Delete Filters Refresh Up directory Upload select a new location/folder on your computer. create a new folder on your computer. delete a selected fi le. Filters are used to return more specific directory results by ignoring (excluding) certain file specifications. Check the Help menu by clicking on the blue question mark in the top toolbar for more information on using filters. refresh the directory to show the current contents. move up one directory (folder) in the heirarchy. upload the selected fi le to the ftp server. Server window: The window on the right lists the fi les on the server. You may need to navigate to the correct folder/directory on the server. Navigation works the same way as in the Computer window. Search Keep Alive Make Directory Delete Filters Refresh Site Manager Quick Connect Reconnect Disconnect Up directory Download search for fi les on the ftp server. keeps you from getting disconnected due to non-activitiy create a new folder on the ftp server. delete a selected fi le. Filters are used to return more specific directory results by ignoring (excluding) certain file specifications. Check the Help menu by clicking on the blue question mark in the top toolbar for more information on using filters. refresh the directory to show the current contents. opens the Site Manager window to allow you to connect to a different ftp server. used to provide a quicker method of connecting to a server, with the advanced options. If you are not sure if you want to keep a profi le of a site, you can enter it here and attempt to connect. reconnect to the ftp server if you are disconnected due to inactivity. disconnect from the ftp server. move up one directory (folder) in the heirarchy. download the selected fi le to your computer. Transfer window: The bottom section will list the status of any fi le transfers (fi les that you are uploading or downloading) that are in progress. 5 Downloading files to your computer Navigate to the folder in the Server window (right side) that contains the fi le you wish to download to your computer. You should see your group s folder, such as group_x. Open the group folder, then open the folder of the person presenting that week. Next navigate to the folder in the Computer window (left side) that you want to download the fi le to. This may be the Desktop or My Documents. Click once on the fi le to select it. Click on the blue Download arrow in the top left of the server section. The fi le being downloaded will appear in the Transfer window. Once the transfer is complete, it will disappear from the Transfer window and you can fi nd it located on your computer. Uploading files to the ftp server Navigate to the folder in the Computer window (left side) that contains the fi le you wish to upload from your computer. Then navigate to the folder in the Server window (right side) that you want to upload the fi le to. Click once on the fi le you want to upload in the Computer window to select it. Click on the blue Upload arrow in the top right of the Computer window to begin the upload process. The fi le being uploaded will appear in the Transfer window. Once the fi le transfer is complete, it will disappear from the Transfer window and will be listed in the Server window. Introduction to the MISD Web FTP Client What is FTP? FTP stands for File Transfer Protocol. It is an Internet service that allows users to copy files to or from computers which hold collections of files. 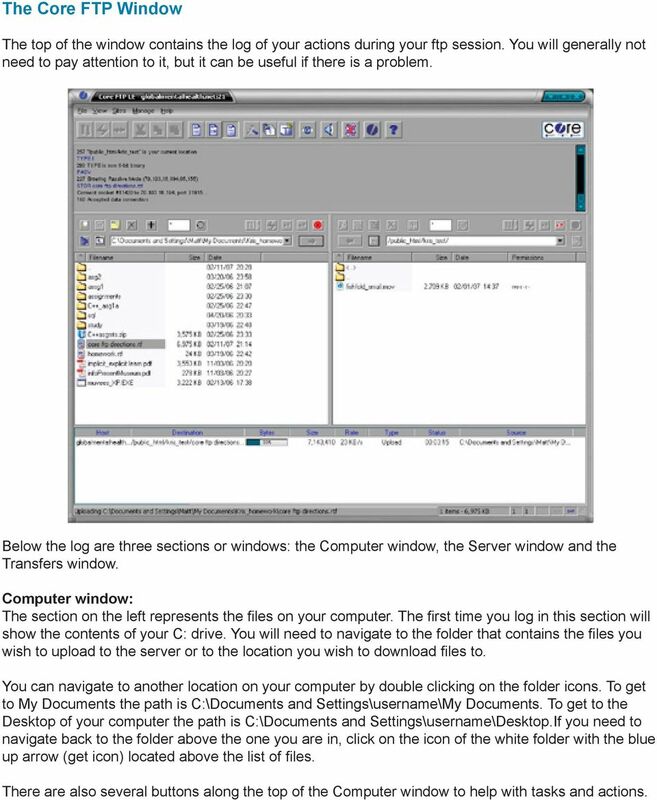 Using SSH Secure FTP Client INFORMATION TECHNOLOGY SERVICES California State University, Los Angeles Version 2.0 Fall 2008. Please note that a username and password will be made available upon request. These are necessary to transfer files. The Reprographics Online E-Copy Process is used to submit print jobs to the RUSD Reprographics department. How do I Install and Use the Cisco VPN Any Connect Client for the Berkeley Campus? Asset Management System User Interface Cabin River Web Solutions Overview The ADI Asset Management System allows customers and ADI to share digital assets (images and files) in a controlled environment. www.nuvox.net, enter the administrator user name and password for that domain. Page 1 of 7 Cute_FTP Server Names and Authentication Before connecting to an FTP site you need three pieces of information: the server name or the site you are connecting to and a user name and password. Launch Internet Explorer Click on the Internet Explorer icon at the bottom left of the computer screen. Go to the UCF Webmail Website 1. In the address bar at the top of the screen, type webmail.ucf.edu. Ashgate FTP Web Login You can access our FTP site very simply via our web portal or by downloading a dedicated program (see pg. 6 below). 1. In your favourite web browser go to www.ashgatepublishing.co.uk. a. Click either Open to open a specific session or Close to proceed to the next screen. NOTE: Please refer to the LinkNavigator CD-ROM s IP Setup Utility if you do not know the LinkStation s IP Address or Host Name.